Prey’s multiplayer mode, Typhon Hunter, sounds like a perfect fit for the paranoia-inducing FPS. Launched yesterday, it puts one player in the shoes of Morgan, while three other players get to be mimics, using their shapeshifting abilities to hide from the gun-toting scientist. Unfortunately, players are reporting lots of issues. Typhon Hunter was originally due out in the summer but it was delayed for six months. Despite the extended development time, it still seems bare bones, missing things like a tutorial, basic PC options or proper matchmaking. One problem that keeps cropping up in user reviews is the poor communication options. You can’t turn off voice chat, you can’t mute other players and there’s no text chat. Being forced to listen to someone yelling in your ear for an entire match is certainly one way to build tension, but it’s the wrong kind. 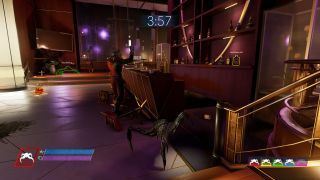 While Prey was developed using the CryEngine, Typhon Hunter is an Unreal Engine game, and for some reason graphics and display options haven’t been brought over in the switch. Graphics settings are limited to four presets—ultra, high, medium and low—while support for ultrawide monitors also seems to have been lost. You also won’t be able to rebind your keys. It doesn’t address all the problems, but playing with bots or in a custom game with pals at least lets you avoid listening to screaming strangers or hissing mics. The update also includes a singleplayer VR puzzle campaign set in Talos I before the events of the main game. VR multiplayer is in the works, too, due out early next year. Typhon Hunter is a free update for everyone with the Mooncrash DLC.